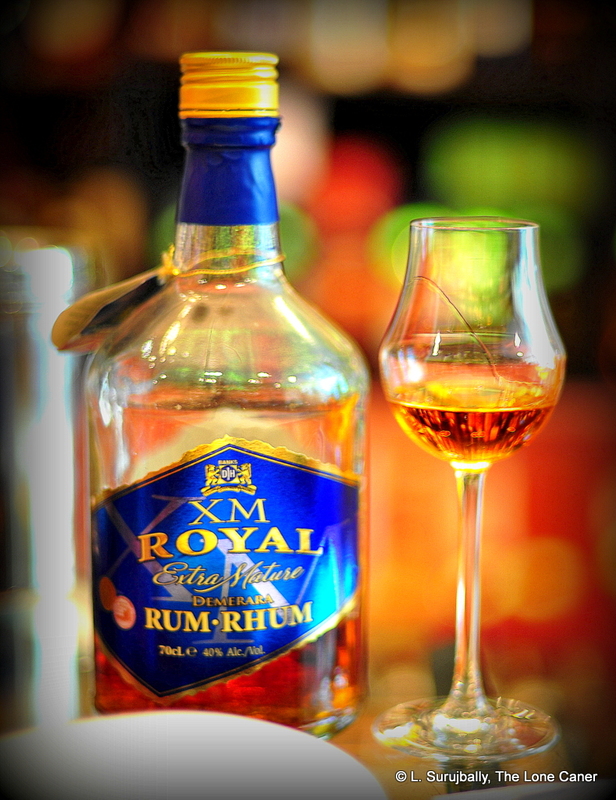 For me this is a rum that evokes real nostalgia, even though I’ve mostly moved past it. I enjoy storytelling, but if rambling background notes and local anecdotes are not your thing, skip three paragraphs. It was a fact of life in Guyana in the 1980s and 1990s that as one moved up the income scale from poor to less poor, one upgraded from Lighthouse matches to bic lighters to zippos; from leaky, loosely packed Bristol cigarettes to Benson & Hedges (gold pack, preferably made in the UK, not Barbados), and stopped swilling the pestilential King of Diamonds (which nowadays has gained stature only by being long out of production), younger XMs and High Wine rums, in favour of the somewhat more upscale Banks DIH 10 year old. Alas, as a young man just growing out of training wheels and nappies, my slender purse (and near nonexistent income) relegated me to matches, Bristols and XM five, which my best friend John and I smoked and swilled in quantities that makes me shudder these days. We’d sit in the convival open-air tropical atmosphere of Palm Court, smoke up a storm (killing those butch Mudland-sized mosquitoes in their thousands), and call happily to our favourite waiter who knew us on sight “Double five, coke an’ a bowl a ‘ice, Prince!” followed by “Keep ‘em comin’ bai! Me nah wan’ see de bottom o’ de glass.” I somehow suspect that were we to get together one of these years, John and I, this routine would not change appreciably, as long as Prince is still around. All right, so much for the reminiscing. What we had here was a tubby bottle quite different from the slim one I recall, containing a dark orange-gold rum bottled at 40%. 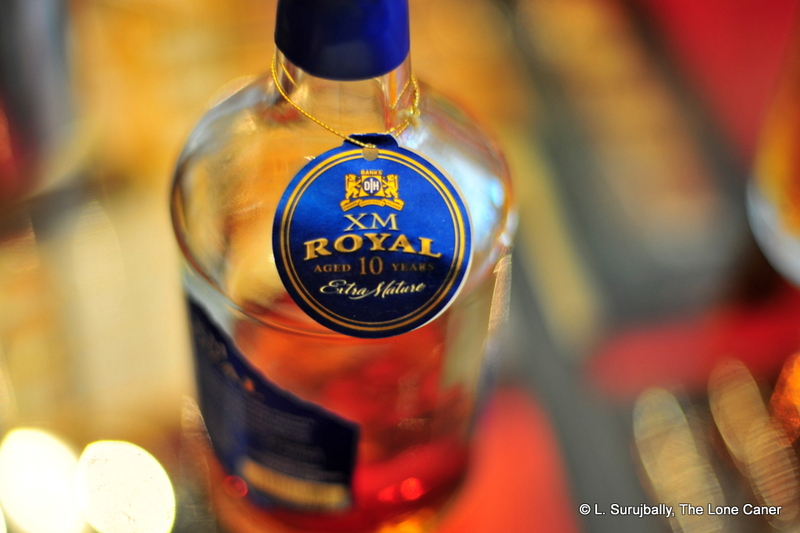 The XM in the title stands for “eXtra Mature” and has always been a sort of informal title for the rums, since nobody ever refers to them as “Banks” – that moniker refers to the company’s beer. It was aged for close on to ten years in bourbon barrels, and then finished for another six months or so in cognac barrels, which allows the company to wax rhapsodic in its marketing materials about this being “a cognac of rums”. Smelling the XM 10 made me wonder whether there wasn’t some Enmore or Port Mourant distillate coiling around inside, even if it’s true they don’t buy anything from DDL. It was warm and not too sweet, pungent with wet cardboard, cereal, vanilla, licorice, dried fruits and some faint rubbery, waxy undertones stopping just short of medicinal. It lacked heft, which was not too surprising given the standard strength, though most casual drinkers would have little to find fault with here – it was perfectly serviceable, if ultimately not earth-shaking in any way. To taste it was quite good, and demonstrated some agreeable heft for a 40% rum (it reminded me somewhat of the Pusser’s 15 in that regard). Medium bodied, soft and quite warm, there was also a queer kind of thin-ness to the overall profile, which fortunately did not transmute into any kind of unpleasant sharpness. It entered with a sort of dusty driness, started with tart flavours of mango and anise and ginger cookies, then softened to flavours of red olives, vanilla, caramel, some light toffee, overripe cherries and bananas – overall, after some minutes the lasting impression it left on my mind was one of light sweetness and licorice, and the finish followed gently along from there, being warm and pleasantly lasting. It did not provide anything new or original over and beyond the taste, simply placed a firm exclamation point on the easy going profile that preceded it. My own opinion was that it lacked body and needed a firmer texture…the XM 10, while not exactly anorexic, gave the impression of having rather more potential than actuality, and the flavours, decent and tasty enough by themselves, suffered somewhat from dumbing things down to standard strength (this may be my personal preferences talking — I’ve gone on record many times in stating that 40% is just not good enough for me anymore — so take that bias into account). 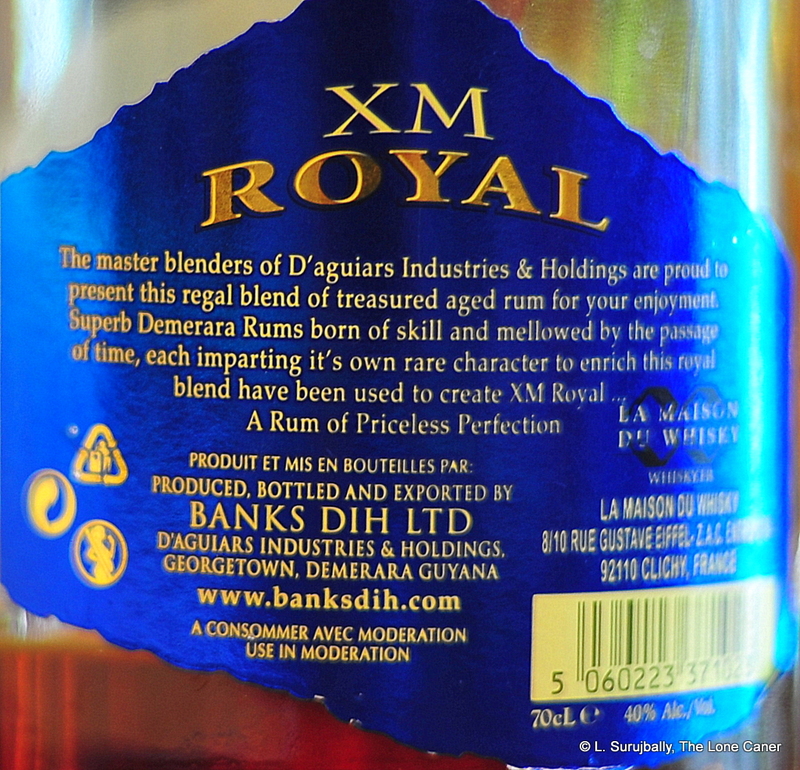 On the other hand, maybe it’s like the DDL 12 year old, a bridge to the better rums in the XM universe like the 12 and the 15…and since I obtained those the other day, once I review them I can tell you whether this paucity of character is a characteristic of this rum only, or some sort of preference of the master blender that permeates the line. Honestly, I hope it’s the former. I find the cheap tinfoil cap to be somewhat surprising for a ten year old rum. Nowadays Banks DIH no longer buy their bulk stock from Diamond and have no sugar cane fields, distillation apparatus or processing facilities of their own. They remain blenders, and buy raw rum from around the Caribbean (Trinidad and Barbados), which is one reason their juice is not and can not be called “Demerara” rum, the other being that DDL won a court case to have that distinction. Since this bottle notes the word “Demerara” on the back label, I suspect it was an older one dating back from before the court case, made from original stocks which were sourced in Guyana. I was treated with extreme courtesy by Jerry Gitany and Christian de Montaguère at the latter’s eponymous shop in Paris last week: after selecting a raft of rums – about seventeen altogether – I plundered ten of their opened stocks, of which this was one. The Little Caner might have been bored out of his mind for the three hours it took me to work my way through those ten samples (it was meant to be only six…Jerry kept opening new bottles for me to try and my resistance was weak), but I had a wonderful time. Merci beaucoup, mes amis.